A purely mucosa-borne temporary restoration for the duration of the implant healing period is full of compromises for the patient, especially in the edentulous jaw. The patient, in particular, therefore profits from immediate-loading treatment, provided the implants are not subjected to any additional risk by immediate loading, which would outweigh the advantages of this type of treatment. Since studies about immediately loaded implants in the edentulous mandible were published over 30 years ago, numerous articles have been published, particularly in the past ten years, on immediate loading with different indications that occasionally produced surprisingly good results. Modern implant geometries as well as refined surgical techniques should increase the primary stability and optimised implant surfaces should improve bone regeneration. The objective is to extend the indication range of immediate loading. Crown fractures frequently force the treatment provider to make a clear-cut treatment choice between tooth preservation and dental implant treatment. Speakers at implantological congresses often like to present impressive implant/prosthodontic solutions for anterior fracture cases, to the point where the audience could be tempted to believe that this was the only appropriate treatment alternative. This case report documents a tooth preservation option that is simple to perform, minimally invasive - and successful. Crombie, F. / Manton, D. / Reynolds, E.
Molar incisor hypomineralisation (MIH) is a widespread and problematic tooth disease. The cervical areas are mainly spared. The affected enamel on the other hand differs from normal enamel by reduced hardness, lower mineral content, increased porosity, higher carbonate and protein content as well as anomalies of the ultrastructure. There have also been reports of bacterial contamination through intact surfaces, anomalies in the dentine and changes of the pulp. Poorer long-term prognoses and restorative results as well as difficulty in patient treatment in connection with these factors make careful assessment necessary as to whether the direct transfer of caries treatment concepts to MIH treatment is practical, even though the remineralisation media used against caries can evidently improve the enamel properties with MIH. This clinical case describes how the prosthetic treatment process was simplified without compromising the esthetic outcome by using a bulk fill composite and a monolithic ceramic. The bulk fill technique reduces the error frequency and the time required for placing restorations compared to the conventional layering technique. Tetric N-Ceram Bulk Fill, which is light-cured in 4-mm layers, simplifies direct restorative filling therapy with chairside composites. IPS e.max CAD, which is processed using CAD/CAM technology, renders the fabrication of restorations very efficient. Furthermore, individualized ceramic layering is no longer required for certain indications. Dental fear, anxiety and phobia are existed in considerable proportions among dental patients, especially children and adolescents. Dental care strategy should be applied by the dental staff depending mainly on behavioral and psychological care before performing the treatment procedures. The non traumatic methods to treat caries should be adopted to provide the accepted treatment by patient and operator and also to build confidence in patients to encourage them to visit the dentist regularly. 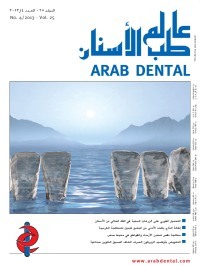 When dental errors occur, they consume much of the dentist efforts attempting to solve them with the minimum damage to the patient and to the reputation of the dentist's carreer, long with a heavy economical burden affecting the dentist, the patient and the society. The subsequent medico-legal liabilty of the dentist and the ethical and religious considerations may be huge. In this literature review, the dilemma of dental errors is put under focus, with the causes, prevention methods and possible solutions for them.